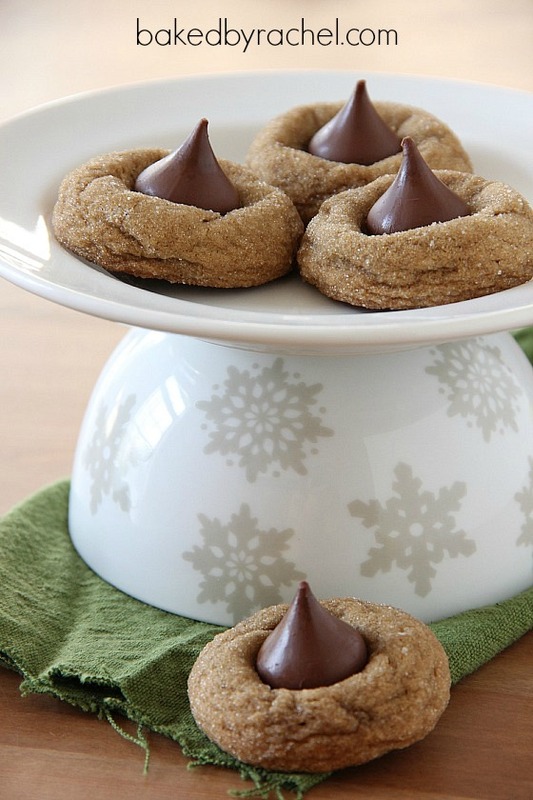 Pillowy soft gingerbread cookies, lightly coated in sugar and topped off with a Hershey’s chocolate kiss. A must make holiday cookie. This is my official kick-off to holiday baking. Or rather, Christmas holiday baking. Because there’s always a holiday of some sort. 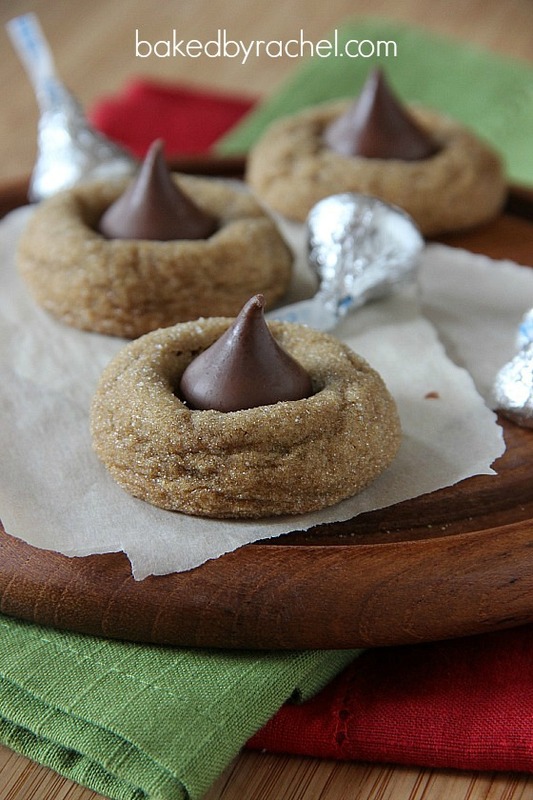 I’ve made a handful of thumbprint cookies before but never a kiss or blossom cookie. I don’t really get why some people call them blossoms. Chocolate blooming from a cookie? They don’t look like flowers blooming. Due to a fairly recent allergy diagnosis in my immediate family, making traditional peanut butter blossoms, aka kiss cookies, were out of the question. My next logical thought was Biscoff because it’s a fantastic substitution for peanut butter in just about any recipe or situation, but it just wasn’t screaming Christmas or holiday baking to me. I had one of those light-bulb moments of o m g it needs to be gingerbread. Yes, seriously. Pillowy soft gingerbread cookies, lightly coated in sugar and topped off with a Hershey’s chocolate kiss. They’re out of this world incredible. I’m not even remotely exaggerating. Of course, you must be a huge fan of gingerbread flavored goodies… but I am, so I’m completely allowed to make that kind of statement. A-maaazing! Make these, love these and never think about peanut butter or Biscoff again. Okay maybe that’s going too far. *Notes: This is a very sticky dough that needs to be chilled prior to rolling. Factor in chill time when planning to make this. Also, this dough freezes well so a full batch can be mixed and only a portion cooked if desired. 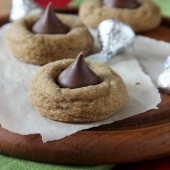 Pillowy soft gingerbread cookies, lightly coated in sugar and topped off with a Hershey's chocolate kiss. In a large bowl combine first six ingredients, set aside. In a large bowl cream butter and sugar. Add molasses, egg and vanilla, mixing until nearly combined. Mix in flour mixture, beating until fully combined. Cover bowl with plastic wrap and chill for 2-4 hours or overnight. Dough should be fairly firm but still easy to work with and roll. Remove dough 20 minutes prior to baking. Preheat oven to 350 degrees. Prepare baking sheet with silicone baking mat or parchment paper. Shape dough into 1" balls, roll in sugar and space 2" apart on prepared baking sheet. Bake for 8-10 minutes. 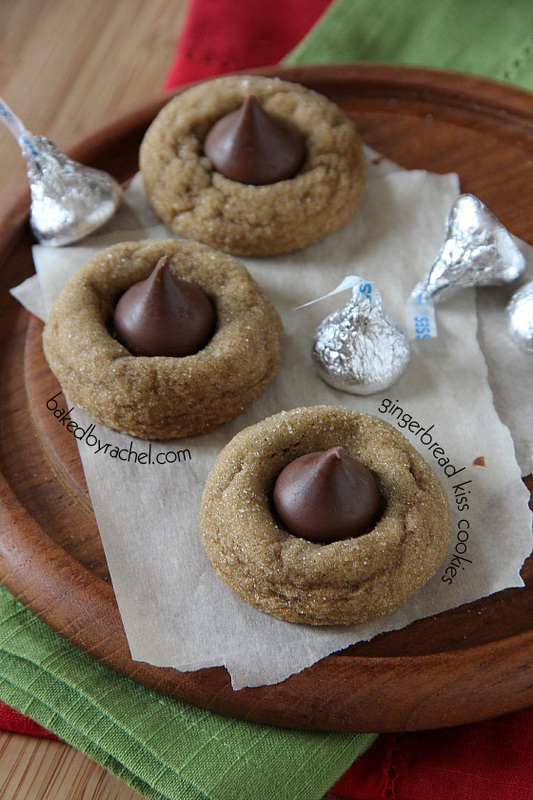 Immediately press an unwrapped chocolate kiss into each cookie. Transfer to a wire rack to cool completely. Store in a covered container.